Time and time again, the best food comes from small, family-owned farms, where the farmers understand the basics, such as soil fertility. They feed the soil first, which produces healthy plants. Healthy plants produce healthy animals. Healthy animals produce healthy meat and milk. When producers add value to a primary product, the ones who make the best food work with the nature of the food, not against it. A good cheese maker, for example, is gentle with the milk. This is not bulldust. If milk is bashed around in high-pressure pipes, lipase, a naturally occurring enzyme, breaks down the butterfat, which then starts to oxidise, resulting in rancidity. Farmers who are gentle with livestock produce better-tasting meat. If a steer is scared on the way to the abattoir, its meat may go deep red and not taste good. Oysters taste of the water they are grown in. Ruin a waterway with farm run-off, and it will affect the oyster beds downstream. Grow oysters in clean water, and they will taste superb. Every year I travel thousands of kilometres around the country interviewing and photographing our best producers. Some producers, whose food tastes great, haven't made it into this list. 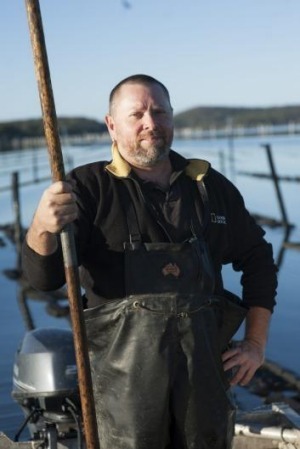 Global warming has led to an unseasonably warm spring in Tasmania, which has temporarily affected a great mussel grower. One of the nation's best legume producers lost an entire crop because of the October heatwave. The following is a brief list of 30 of Australia's best producers. Their food tastes good and is consistently available. The fact that most, but not all, are small and ethical is no coincidence. 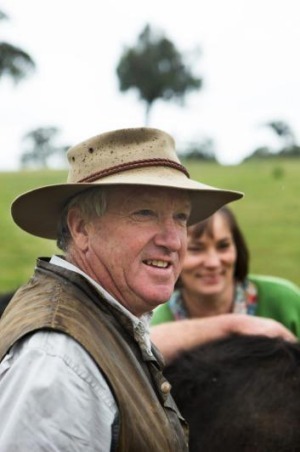 Allen and Lizette Snaith​ have spread their herd of Scottish beef breed belted Galloways across farms around Victoria. Grass-fed on the best pastures the state has to offer, the animals develop really good intramuscular fat, and are slaughtered at 30 to 42 months. The meat is then dry aged. It is well marbled, presents well, cuts beautifully and is consistently good. Out in the NSW Central Tablelands, organic farmer Rob Lennon grazes wagyu cattle on perennial, deep-rooted native pastures. He cares deeply about the health of his soil and runs his hormone-free herd using low-stress husbandry. He supplies whole carcasses to butchers and restaurants from Melbourne to Mackay, who appreciate their full, robust and beefy flavour, long, juicy chew and clean, not greasy, finish. All other lamb pales into comparison to the chops and rumps from these old-English meat-breed lambs raised on native pasture on the lower reaches of the Murray River near Meningie in South Australia. Pure Suffolk lamb is grown by one of Australia's most respected growers, Richard Gunner, and he consistently produces animals with incredibly sweet and well-flavoured intramuscular fat. Jos Webber grows a Kenyan variety of coffee beans in the Byron Bay hinterland using biological farming methods. He doesn't spray for pests or use fungicide, and he processes, dries and roasts his beans on site. Because he takes off only the last layer of parchment just before he roasts his award-winning beans, they convey an extra layer of character and flavour. 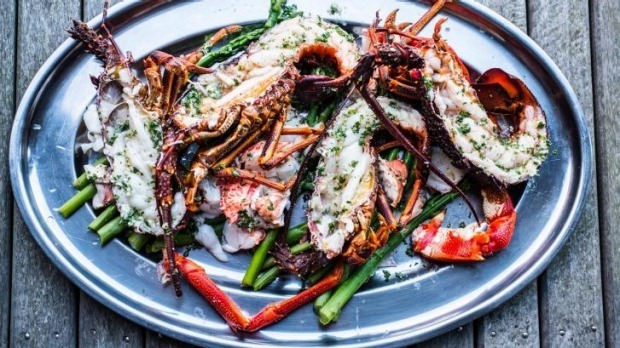 Finest fare: Lauren Mathers feeds her Bundarra Berkshires. On the flats near the Murray River at Barham in south-west NSW is this free-range pig farm being converted to biodynamics. 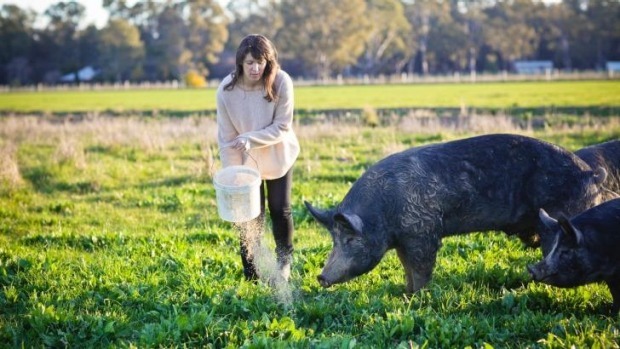 Lauren and Lachlan Mathers raise just 1000 pigs a year and process them in their on-farm butcher shop, making preservative-free sausages, hams and smallgoods. Ilan​ Goldman is one of a handful of growers of Australian-bred Sommerlad​ outdoor-raised meat chickens. This unique breed of birds was crossbred to be raised outdoors. Goldman raises his on grass in large, open-air cages that are moved daily. 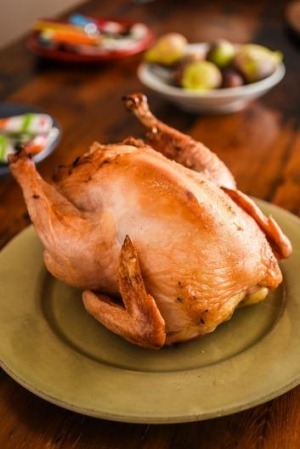 Although the flavour and texture are amazing, the birds are about $40 a pop, but one chook can provide a family of four with three meals. 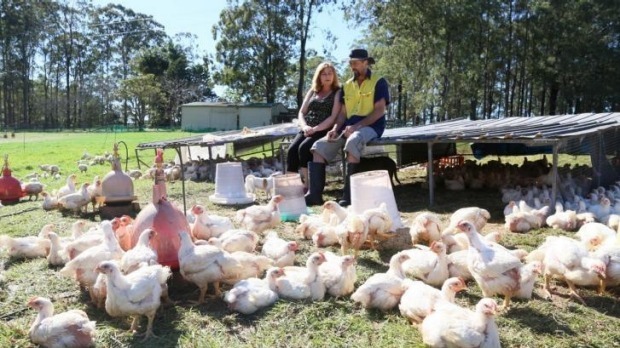 Beth and Hayden McMillan are on the mid-north coast of NSW and are the only accredited Humane Choice meat poultry growers in the country with their pasture raised Pekin and Muscovy ducks. Their ducks are consistently juicy and tender with skin that crisps perfectly. Every summer, when the pink salt lake near Dimboola in Victoria's west dries out, the team from Mount Zero Olives gets together with the Aboriginal Barengi Gadjin​ Land Council to bring in the sun-dried salt. Naturally pink from beta carotenes produced by salt-loving bacteria, it is a good, honest, tasty and attractive product. Wayne Cripps' family has been fishing the shallow waters off Wilsons Promontory since 1874. They net and hand-select the fish in the water, before chilling them on ice slurry. The result is super-fresh fish, such as King George whiting, garfish or rock flathead. They work twice a day, about three times a week. These fat, meaty and luscious Sydney rock oysters are grown in floating baskets in the clear waters of Wapengo Lake on the NSW south coast. The estuary is fed by creeks rising in the forests around Mumbulla Mountain near Bega. Grower Shane Buckley has worked to have logging practices in the forest modified and the roads around the lake paved to stop run-off into the lake. 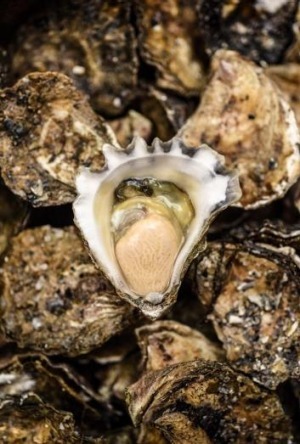 Certified organic, the oysters are harvested at three to four years, when they have deep shells and meaty adductor muscle. 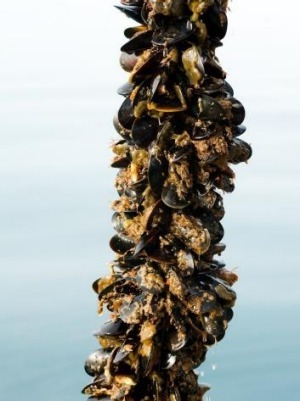 Mussels, native to Port Phillip Bay, are bred in hatcheries, attached to long lines and suspended in the cool, clear waters entering the heads from Bass Strait. Owned by Lance Wiffen and family, Sea Bounty produces mussels that are large, sweet and delicious. The establishment of pasture on this beautiful island in the middle of Bass Strait caused wallabies to leave the bush and breed up to pest numbers, feeding on the mix of European and native grasses. 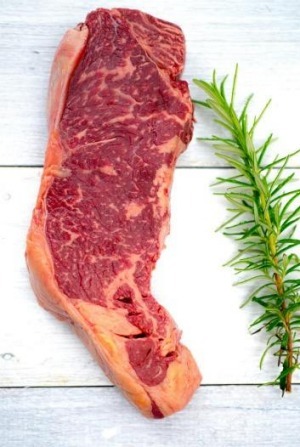 The Madden family, of Flinders Island Meat, found a solution. The wallabies are culled by licensed shooters, processed on the island, and sent to butchers and restaurants around Australia. The meat is chemical free, lean and very flavoursome. The product creates jobs for the islanders. Naomi Ingleton studied in France to perfect her method of culturing cream. 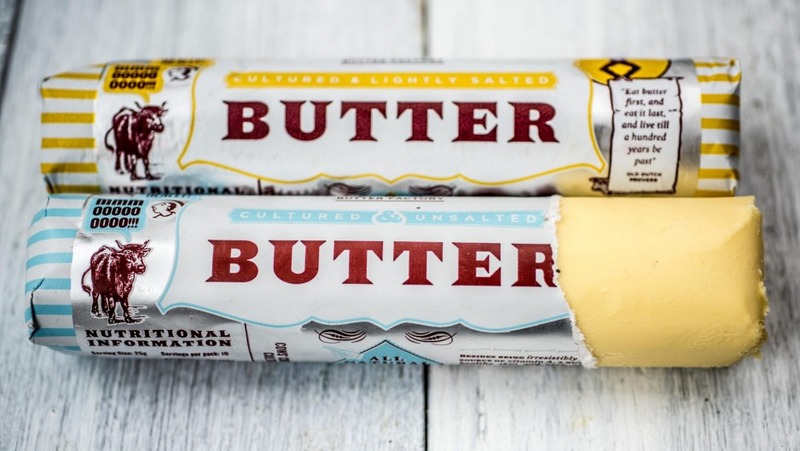 Live cultures are added to cream from local high-country dairy farmers, then it is batch fermented to give it a sour tang and complex flavours. 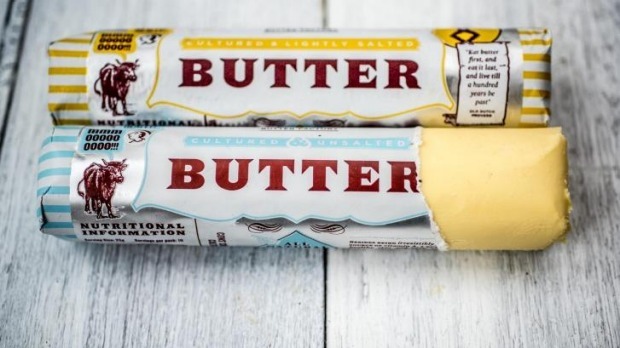 It is batch-churned, salt from Mount Zero's Pink Lake is added for salted butter, and it is rolled into 250-gram logs and 500-gram blocks of French-style cultured butter. The lobster trapping in Bass Strait is subject to very tight restrictions to maintain a sustainable industry. 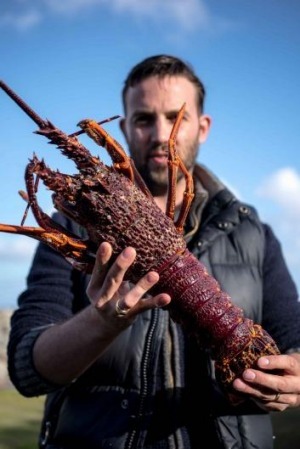 About 20 boats trap lobsters, known locally as crayfish, in pots and land them at Currie on King Island. From there, Max and Donna Summers, of King Island Seafoods, airfreight live lobsters to South Australia, Victoria and NSW. 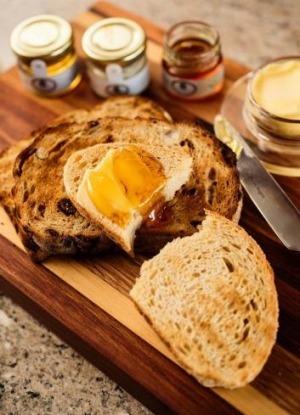 Jodie and Steven Goldsworthy work with some of the most hardworking beekeepers in the nation, harvesting honey from beehives often located in remote native bush. They produce unheated, natural, unblended honey. The Goldworthys travel around Australia and the world, lobbying to protect bees and educate how important they are in agriculture. There are more than 50 small-scale, family-owned dairies around Australia committed enough to invest in pasteurisation equipment to provide fresh local milk daily. Hats off to you all. When Simon Schulz found out he had a listeria problem, however, he told the world. For his sheer honesty and determination to provide excellent organic milk that tastes great, he has my support. High in the wet, cool, misty Atherton tablelands inland from Cairns is a biodynamic dairy farm where the Watson family produces smooth-as-silk, tub-set yoghurt with no added sugar or thickeners. The outstanding quality of the milk shines through, even the yoghurts are flavoured with local bush-grown Davidson's plum and bush honey. 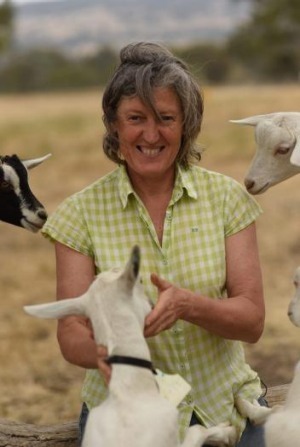 Carla Meurs​ and Ann Marie Monda​ run a small goat herd in the granite country near Mount Alexander. Their animal husbandry is superlative, their care of the land commendable, and their cheese consistently excellent. La Luna has a wrinkled yeast rind, creamy interior and clean citrus finish. Burke and Bronwyn Brandon produce perhaps the best blue cheese in the country from their herd of East Friesian ewes. Rich and creamy without being too moist, it is full flavoured, but has a delicate finish. It is made on a farm with minimal artificial chemical input in a beautiful part of Gippsland. 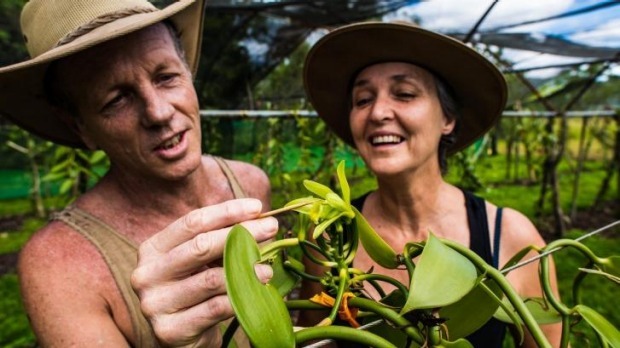 Fiona George and Matt Allen grow 1800 vanilla orchids on the Russell River flats near Innisfail in far-north Queensland. They hand-fertilise each flower and carefully dry the beans, resulting in strong, complex vanilla that is aromatically potent. 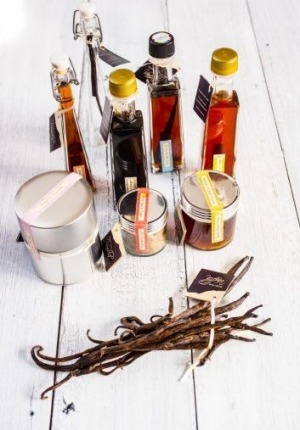 This chemical-free, low-input, award-winning operation sends vanilla around Australia. Up in the green Strzelecki Ranges in Gippsland, farmer Ian Onley​ milks a few cows and then ferments the milk to feed his pasture-grazing Isa Brown hens. Protected from foxes by Maremma dogs, the biodynamically certified flock produces eggs of exceptional quality with flavoursome yolks and whites that are perfect for baking. Brothers Cihan and Gianaire Paksoy​ were born in Turkey, and continue their traditional way of growing and drying vine fruit, using no chemicals in the vineyard, orchards or the drying racks. Their sultanas, muscatels and raisins are full flavoured and sweet. Mick and Rowena Ellis have just 250 caper bushes on the flats of Broken River near Mansfield in the Victorian high country. They farm without pesticides, use lots of mulch, hand-pick the capers in late spring and summer, and preserve them in Murray River salt. The capers are small, plump and aromatic, with touches of dark chocolate and raspberry. Chris Nathanael​ is known as the Top End's godfather of tropical fruit, growing 200 different species of tropical fruit and more than 30 varieties of mango. He eschews as many chemicals as he can in his orchard outside Darwin, and sends superb mangoes by post around Australia. Tony and Lina Siciliano are an elderly Calabrian couple who farm their few hectares on the banks of Rose Creek in suburban Melbourne. Their hen manure and compost feed the olive trees, which are harvested in small batches when their olives are ripe. The press is metres away from the trees, so the freshness of the oil is outstanding. Smooth and unctuous, it has a hit of grass, with a nice catch at the back of the throat and a clean finish. When he had a problem with coddling moth, biodynamic grower Neville Mock blew the pests off the bark of his fruit trees with a sandblaster. In the deep-red soils at Red Hill on the Mornington Peninsula, he grows exceptional apples, and makes good cider and a light but well-rounded natural apple-cider vinegar, perfect as a tonic or as a dressing for salads. Making the most of their microclimate in the Western Australian wheat belt, the Lloyd family has protected its farm and soils by adopting biodynamic farming practices, planting thousands of trees to stop wind and erosion and producing 60 per cent of the mill's electricity through solar power. This is excellent flour for great cakes and bread. The frogs and small fish fall prey to the snakes and water birds hunting and fishing around Andrew and David McConnell's biodynamic rice farm near Barham in far south-west NSW. The efficient use of water and lack of sprays result in not only great tasting and easy-to-cook biodynamic rice, but a complex biosphere of wildlife. When the world went wild for quinoa, it left villagers in South America starving for their dietary staple. Lauran​ and Henriette Damen​ planted quinoa to provide Australians with highly nutritious quinoa. It is not as highly processed as the imported supermarket product, but it is delicious. 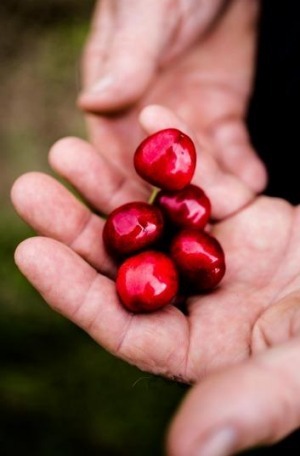 Trevor Holmes invented high-class farmgate sales in the 1960s, when his dad traipsed up the rough road from Red Hill, about 70 kilometres south of Melbourne, to the market, only to have his delicate delivery of cherries rejected. Trevor immediately put up a sign on the highway, and for the past 50 years, his family has been selling fat, ripe juicy cherries direct to the public.